That idea was the germ for writing “The Wizard’s House.” I wanted to play in a landscape similar to that of Nausicaa of the Valley of the Wind (another Miyazaki film). I wrote this piece about a young man and his search for a wizard’s flying house, and then I wrote the second installment, called “The Unborn God.” It was the second installment that was picked up first and ran in an earlier issue of Beneath Ceaseless Skies, garnering a positive review from Locus. Now the “prequel” has appeared, and you can read it here. I’m not sure how I’d categorize these stories. BCS publishes “literary adventure fantasy,” and that probably fits pretty well. I might also affix descriptions like “surrealist” or “magical realist” to these. I try to describe the fantastic elements in as concrete, everyday language as possible, as they would appear to the characters. And I’ve had quite a bit of fun with these characters: the timepiece, the wizard, and Sylva. These were enjoyable stories to write, and I hope you enjoy reading them. My favorite parts are the descriptions of the clouds through which the characters pass on their travels. I love watching the skies from airplane windows; the shifting cartography of clouds and the landscape below. That’s what I’ve tried to capture here. 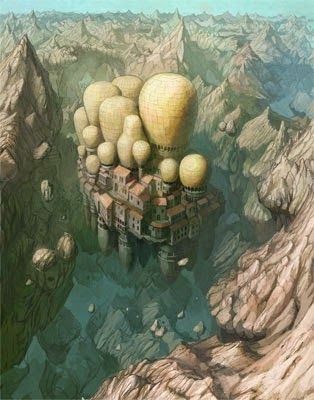 This entry was posted in Stories and tagged Beneath Ceaseless Skies, Castle in the Sky, fantasy, fiction, flying castles, Hayao Miyazaki, Howl's Moving Castle, magical realism, Nausicaa, short stories, stories, surrealist, The Valley of the Wind on February 21, 2015 by boldsaintcroix.